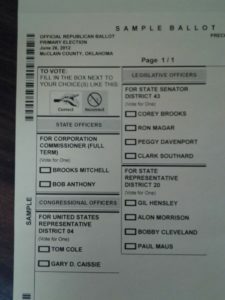 Today was Oklahoma’s state primary election. Since Independents are the political equivalent of lepers in Oklahoma, they were not allowed to participate in any of the elections happening around the state. (at least no elections I am aware of) Still, I did my duty to stop by and ask if I was allowed to vote. The nice ladies manning the polling booths politely told me no. First up we have the Democratic Primary ballot. Not a lot happening here. First on the list is the Democratic Challengers for the US Representative 4 seat. Donna Marie Bebo and Bert Smith. I met the two of them and I must say that I hope Bebo gets the nomination. She was anti-SOPA and anti-ACTA. Smith was anti-SOPA but for some strange reason pro-ACTA. Not sure how that works. The next two elections I am not too concerned about. I will say that Rodney Johnson was enthusiastic about Ballot Access Reform but never got in touch with me to follow up with some questions. I guess I wouldn’t mind seeing him in November. On the Court Clerk side, this election will be decided here. Not sure why this is partisan at all. For that matter I have no clue why that is an elected position. I do hope that Berry wins just because Baker is the incumbent. No other reason. 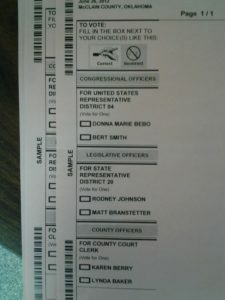 Next up is the Republican Primary Ballot. There is not much more happening here. First up is the Corporation Commissioner. This one is decided with this primary election. Both are Republicans and are probably equally so. I really don’t care who wins. Then we have the US Representative 4 seat. We have incumbent Tom Cole vs Gary Caissie. I am not particularly fond of Cole. He is a bit of a mixed bag. Even though I am voting for RJ Harris in November, I would like to see Cole unseated here. Then we have the State Senate and House races. These seats are brand new seats after redistricting, so no incumbents. Whoever wins these seats will be running against a Democratic opponent come November. From the Senate side, I absolutely despise Brooks. The guy is a die-hard Republican and unwilling to compromise on anything. He was pretty solidly against the idea of Ballot Access Reform. I seriously hope he does not win. I would like to See Ron Magar win this primary and go to the elections in November. On the House side, Alon Morrison and Paul Maus both made good impressions on me. Morrison for his quick and decisive support for Ballot Access Reform and Maus for his overall willingness to be open to new ideas and compromise. I would love to see either of them in November. So that is it. I will be checking on these primary elections as the night rolls through. You can follow my updates on Twitter. During the week of May 21-25, Egyptians will get the long desired and much fought for opportunity to elect a new president for their nation. They paid for this opportunity with their blood. We as Americans and specifically Oklahomans cheered them on through their trials and protests to gain that right. As a result of their efforts, their blood, they will have the opportunity to choose a new President from a slate of thirteen candidates. Thirteen! How wonderful it must feel for these people to choose a president from such a wide array of view points representing the wide variety of people in their nation. While we applaud them on in this wonderful demonstration of democracy in action, Oklahoma’s Senate is once again sitting on an opportunity to bring similar democracy to Oklahoma. For many years, the Oklahoma Legislature has been presented with bills that would have brought Egyptian level democracy to this state. Yet, every time it has been brought to a vote, someone stands in its way. This year, this has happened again. This November, when Oklahomans take to the polls to elect the President, they will be presented with a ballot containing a grand total of two candidates for President. Two! What a contrast. Why should Egyptians be cheered on as they vote from thirteen candidates while we stand complacent voting from two? Why are we complacent in the illusion of democracy in this fine state? Egyptians recently got the long-desired and much fought for opportunity to elect a new president for their nation. They paid for this opportunity with their blood. We Americans and specifically Oklahomans cheered them on through their trials and protests to gain that right. As a result of their efforts and their blood, they’ll have the opportunity to choose a new president from a slate of 13 candidates. Thirteen! How wonderful it must feel for these people to choose a president from such a wide array of viewpoints representing the wide variety of people in their nation. While we applaud them on in this wonderful demonstration of democracy in action, Oklahoma is once again sitting on an opportunity to bring similar democracy to Oklahoma. For many years, the Legislature has been presented with bills that would have brought Egyptian-level democracy to this state. Yet every time it’s been brought to a vote, someone stands in its way. It happened again this year. This November, when Oklahomans take to the polls to elect the president, they’ll be presented with a ballot containing a grand total of two candidates for president. Two! What a contrast. Why should Egyptians be cheered on as they vote from 13 candidates while we stand complacent voting from two? Why are we complacent in the illusion of democracy in this fine state? Not really a bad edit job. I hope to write more to them and I need to write more here and on the other sites I run. Getting out of practice. There was a time once, when I thought that phrase meant something. Back when I was going to school learning about the political process in Civics class. You know, when you sit in learn about the American Revolution and what those Founding Fathers committed treason to obtain. They risked their lives and the lives of their families in order to bring about a system of government in which the people of the 13 Colonies could choose the people that represented their interests. Can you imagine the pure determination and fear that must have run through the hearts and veins of those men as they each signed onto the Declaration of Independence? By signing that letter, they were putting themselves onto the top of England’s most wanted list. A list that was titled ‘Wanted, Dead or Alive.” These men then fought in a war to solidify their determination, their love of liberty, their desire to be ruled by the people for the people. Many people died in support of these treasonous heroes. That is certainly what they said when the English government repeatedly refused to acknowledge and listen to the pleas and petitions of the American people. Would they have said the same thing as they witnessed Oklahoma’s government do the same to the people of Oklahoma? I certainly think so. At the time, the English Government wasn’t a harsh ruler doling out punishments at will. No, it was simply an apathetic government which ignored the American Colonies in order to focus on building up the English Empire. What we have right now in Oklahoma is an apathetic government. One that ignores the plight of the Oklahoma people in order to maintain and build up the empire of the two major parties, the Republican and Democratic parties. Let’s pause and think about the poetics of those two names. Both names are derived from the same roots of two words used to describe our system of government. A Democratic government is one in which all the people ruled under it have an equal voice in the affairs of the state. A Republic government is one in which the people elect representatives who represent the ideals of those who elect them. Both systems of government are built around the idea of equal representation. The Democratic government in which every voice is equal; the Republic government in which every person has an equal opportunity to elect a representative. Think about that as you witness these two political parties usurp the will of the people. Think of that as you watch these two parties continually deny the people an equal voice in the affairs of this state. These two parties have become destructive to the unalienable rights of the people of this state. These two parties have decided that not everyone is created equal. These two parties have decided that they no longer derive their power by the will of the people. It is time we stopped them. It is time that we as a people, united, declared our independence from the rule of tyrants. It is time that we as a people, united, declared that we will no longer be satisfied for second class status. I am tired of waiting for the Oklahoma Government to decide that it wants to give me back my right to be represented in our government. I am tired of sitting back and waiting for these two parties to decide to invite Independents out of the goodness of their hearts to participate in this Republic. It is time to declare our independence. We have a system in this state in which the people can propose laws and the people can vote to enact them. This system was designed for times in which the people felt that the government could no longer be relied upon to do its duty. There are over 200,000 registered Independents in this state. We only need a bit over 100,000 signatures to declare a state question in which we can revert our election laws back to what can truly be called “free and equal”. We have the infrastructure to do this. It can be done. What we need to do is put together an initiative petition to strike out the language that wrote the Republican and Democratic parties into law. We need to then revert the petition requirement to the original 5,000 that was required prior to 1974. Two very simple changes that will bring about a mountain of change in this state. That is my declaration of independence. Uncontested – These are those who will take office simply because they filed for candidacy and no one else did. These are uncontested seats. Primary – These are those whose only challengers are within the same party. This means they will have won their seat after primary votes are cast. November – These are those who have a challenger outside their party and will be decided in November. District 1: November. 2 Republican, 1 Democrat and 1 Independent. There are no Independents running in the State House. Based on these numbers, it seems that when it comes to State politics, the vast majority of Oklahomans are not all that politically active. Just based on the State House numbers, Republicans are guaranteed a 47% presence in the house with the possibility of snagging another 34%. This means that Oklahoma will continue to have a Republican controlled House. It is not too surprising to see Democrats in the minority in all races this year. They will have only a guaranteed 20% presence in the House. They may capture some of the 34% up for grabs in November, but I doubt it will be enough to counter the guaranteed presence by the Republicans. The 2010 election set Republicans in the majority in the Senate. This election looks to seal that majority for another 2 years at least. With 11 of the 24 seats going directly to Republicans with most likely a majority of the November elections going to Republicans, it will be difficult to out the Republican majority in 2014. Essentially, all the 24 seats in 2014 would have to go to non-Republican candidates in order to break their majority hold. Unfortunately, if this year and 2 years ago are any indication, that will be near impossible as most seats are either decided at filing or in the primaries. Of all races this year there are only 9 Independents running, with 6 of those for US Representative. The state of Independents in this election is most likely a symptom of Oklahoma’s harsh ballot access laws. Since Oklahoma makes it prohibitively difficult to form new parties, many Independents are probably jaded toward the election process. This jaded attitude probably also explains why it has been so difficult to pass ballot access reform as well. In the end, one thing is for sure, Republicans will continue to control the state government in all branches. We will continue to see a push furthering the Republican agenda. Some of it will be good. Some of it will be bad. But unless we can get a more politically active populace that is willing to challenge the status quo, we will not see real change in this state for at least another 2 years. In the last week of March, the Entertainment Consumers Association (ECA) took to Capital Hill to meet with members of Congress about SOPA, PIPA and other issues that effect gamers and game developers. The trip was spearheaded by ECA President, Hal Halpin, VP, Jennifer Mercurio and Advocacy Manager, Brett Schenker. I had the opportunity to come, along with James Portnow of Extra Credits and Trevor and Josh Hughes of Add A Tudez Entertainment. Coming out of it, I think the event was very much a success. While SOPA was one of the primary focuses of our various discussions, we did have some time to talk about other issues that effect gamers and game developers. So rather than just file down through everything that happened, what I would like to do is share a few things that really stuck with me after the event. 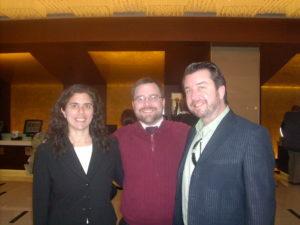 On the topic of SOPA, we had some very good discussions with the offices of key members of the SOPA opposition. These was a staff member from Zoe Lofgren‘s office, Representative Jared Polis, and a staff member of Jason Chaffetz‘s office. The discussions we had about SOPA were very encouraging. Each person we talked to expressed their desire to continue the fight against SOPA like legislation. They all expected it to come back in some form or another, so they want us all to be aware and keep watch. They know that it was the efforts of the wider internet community that made the difference back in January. On to the subject of PIPA, the Senate’s version of SOPA, the only player from this side of the debate that I had the opportunity to visit with was a staff member of Senator Tom Coburn‘s office. If you recall, Senator Coburn was one of the supporters of PIPA prior to the January protests. Right around the time of the protest, he pulled his support for the bill. This was a major blow against the bill, as Coburn sits on the Technology Subcommittee. Based on the discussion we had, it would seem that Coburn pulled his support because he did not fully appreciate what was in the bill. The conversation was primarily a fact finding mission from his office. They wanted to know more about piracy and how it affects game consumers and game developers big and small. In the future, I think we could probably count on Senator Coburn to be a voice of reason in the debate. Now onto some other points of interest. Back in Representative Lofgren’s office, one of the topics that came up was a general reform of copyright, particularly revolving around the Digital Millennium Copyright Act (DMCA). We were asked what we would want to see happen with the DMCA and copyright to bring it back into balance with the public. One of the key points was reform of the DMCA takedown process. Right now, this process is very much weighted against fair use and free speech. There is also very little in the way of discouraging abuse of the process. Based on the conversation we had, I would hope to see some reforms being introduced in the near future. Of course, like any reform of copyright that is not 100% in favor of large entertainment companies, this type of reform will be fought hard by the MPAA and the RIAA. So when we do see it introduced, we need to show our support for it in much the same way we showed our opposition to SOPA. The next really interesting bit of discussion came while visiting with Representative Chaffetz’s office. While we were talking about SOPA and other issues, Chaffetz’s staffer told us a story that recently happened on Capital Hill. Nintendo was there, presumably about the recent DMCA anti-circumvention exceptions approval process. As you may recall, one of the exceptions asked for this year is the ability to jailbreak a game console to allow for extra functionality to run on it. Nintendo was there showing off how DS carts like the R4 work and trying to explain how evil they are. While they were showing it off, Chaffetz’s staffer was looking at it and thought it was a pretty neat device. He then asked Nintendo’s reps if they have similar functionality available legitimately for the handheld. When asked that, Nintendo’s reps looked at him as if he asked them something completely insane. Our conversation with the Staffer then went on about how jailbreaking and things like the R4 allow for so much more than just piracy. Things like homebrew software, other operating systems, importing games and format shifting legally owned games are all possible. This really interested the staffer. So while we still don’t know if we will get an exception for jailbreaking game consoles, we now know just how much effort console companies are putting in to put a stop to it. So those are the most interesting things that I got to participate in. There was another set of visits that I didn’t get to attend that probably have their own cool things discussed, as there were two teams holding meetings. Perhaps James, Josh or Trevor will have something to share from their points of view. I think the trip was fun and very much worth it. When the ECA plans another one, I hope to be able to attend that one as well. Check out Josh Hughes’ write up about our trip to DC. Why Is Our Logo Censored? You may have noticed that our logo is censored with a link pointing to American Censorship. You will see the same thing at Divine Knight Gaming, Random Tower and Mormon Libertarian.There is an interesting story about it. What is happening is the US government at the behest of a number of media companies such as the RIAA, MPAA and the ESA are working to pass some of the worst copyright legislation in US history. These two bills are titled “Stop Online Piracy Act” in the House and “Protect Intellectual Property Act” in the Senate. What these bills hope to accomplish is a reduction in movie, music, game and software piracy as well as reduce counterfeit goods from entering the US. They hope to achieve these goals by giving sweeping power to the US Attorney General and copyright holders the ability to prevent ad providers, credit card processing firms and DNS providers from working with websites that are “dedicated to infringing activities”. These bills would also make it illegal to stream or upload any video or song that is covered by copyright that you do not have rights to. Sadly, these bills will be used to censor a lot more than copyright infringement. Under these bills, sites like YouTube, Twitter, Flicker, Facebook and any other site that allows users to upload content will be liable if anyone uploads copyrighted materials without permission. That means that if someone uploads a video to YouTube that infringes a copyright, movie studios would be able to have all of YouTubes services cut off and whole swaths of legal content will be censored as a result. That isn’t even the worst of it. Currently under the DMCA, copyright holders can only ask for certain content to be removed. If the site owner removes said content they maintain what is called “safe harbor” protections. This prevents the site owner from being sued for copyright infringement for something a user of the site did. This is a good thing for sites like YouTube because safe harbors have allowed it to continue to operate and be a vessel of free speech for millions of people. Under SOPA, all that goes away. Now, it doesn’t matter what the site owner does, they will have no safe harbor to protect them. If only one person uploads a copyrighted song or video, the whole site is gone even if the rest of the millions of videos are perfectly legal. Additionally, SOPA and PROTECT-IP have no punishment for false accusations. A copyright holder can have a site removed and if it turns out to be a completely legal site, there is no punishment for the false takedown. Nothing happens to that copyright holder. That is beyond bad. There should be some kind of punishment such as a fine of $150,000 per false takedown. But no. They can get away with it. One last thing I would like to share is that under these laws there is also no court involved. Copyright holders can just fire off letters at will to ISPs, DNS providers, Credit card companies and ad companies and those companies have to follow the law or they can be prosecuted for copyright infringement that had ZERO to do with them. This is absurd on a major level. These companies are completely neutral in all this but they run the risk of being prosecuted themselves if they don’t comply. Not with a court order, but with a letter from some random person or company. If a court were involved, these copyright holders would have to prove that the site is actually infringing before anything could happen, but the content industries don’t want to have to get a court order. They feel it is too much work. In the end, these laws are not about stopping piracy. These laws are about unloading the burden of policing the content of copyright holders like those under the RIAA, MPAA and ESA onto third parties that have absolutely no power to control what users of the internet do. They don’t want to have to do the work themselves. These bills need to stop now before they can be voted into law. Using the link provided at the beginning of this post and that can be found by clicking the black bar over our logo, you can contact your Senators and Congressman and tell them not to vote for this legislation. Tell them that you like our internet as it is. John Carmack had plans to release the source code of Doom 3 to the open source community, but it was delayed because of an old patent infringement threat. Everything worked out in the end because he was able to work around the code. The same can not be said for Linux and Android who are being threatened by Microsoft over patents it refuses to disclose. Warner’s Ultraviolet DRM is a piece of crap and in an attempt to promote its use, Warner decided to give away free digital copies of Batman Forever with the video game Batman: Arkham City. No joke. Research firm Evisional has released some piracy statistics for the UK and found that game, movie, tv and software piracy is on the rise. Music piracy is on the decline. Sadly, there is no information on how they determined this so we can’t verify the numbers. A bunch of Chinese game developers are suing the Chinese search giant Baidu for copyright infringement. What is Baidu’s crime? Linking to games that can be downloaded. There are no files hosted with Baidu. The links just show up in search results. The game developers need to learn from the music industry which entered a licensing deal with Baidu. So that’s it for this week. Keep an eye out for more. This week is a rather short week. I didn’t have a lot of time to write new articles. So, there are only two of mine and one from the ECA. Doesn’t really change the importance of the topics discussed, so let’s jump right in. The Swedish Pirate Party was invited to the Swedish game show Gamex. Just a week before the show, after they have paid for their booth and have been featured on advertising for the show, the people running the show told them they weren’t invited. Apparently someone wasn’t very happy about the Pirate Party’s presence and pressured the show to lock them out. It wasn’t a blanket ban on political speech as another political group was allowed there. Everyone Freak Out! Gangs Have Discovered The Internet! Yes. Gangs have discovered the internet. The National Gang Assessment Center does an annual study on gangs and what they are up to. This year got some attention in the game world because the study mentioned Second Life, a popular MMO, as a tool gangs use to communicate. I delved in a bit deeper into the whole section on technology that basically says that gangs are using the internet to communicate. You know, just like everybody else. This isn’t some new thing, it just seems the federal government is a few years behind everyone else in figuring this out. This one wasn’t written by me. This is from Jennifer Mercurio of the ECA. I had asked the ECA to write up a guest article on why SOPA would be bad for gamers and this is what they sent over. Great stuff. I am extremely glad that I had the opportunity to work with the ECA for a number of years and still keep in touch with them. It’s nice to have connections. So that’s it for this week. I have a few new articles lined up for next week so keep an eye out. So I have been bad. I meant to focus on these articles on a weekly basis and have been slacking this past month. It is not that I have not been busy, but I have neglected my blog for the most part. I did get out an announcement of my new book, Random Battles, and write an open letter to my Congressman and Senators. So there is that. Plus this month had a whole lot of articles on Techdirt. So here we go. Netflix made the mistake of trying to break its DVD by mail service from its streaming service without taking into consideration what their customers actually wanted. That turned out to be a bad idea and they backed out. Barnes & Noble and Amazon are in a bit of a war over digital comics. Amazon won exclusive rights to a segment of DC’s digital line. So in retaliation, B&N removed all the physical copies of those comics form their shelves citing a policy of “make available any book, anywhere, anytime” Yeah, I don’t get how tis move complies with that either.